When I heard there was an 80's Prom at SNAP Conference, I immediately thought “neon”. The 80's was totally more than just neon but neon is BACK and it is so easy to find neon clothing and accessories. 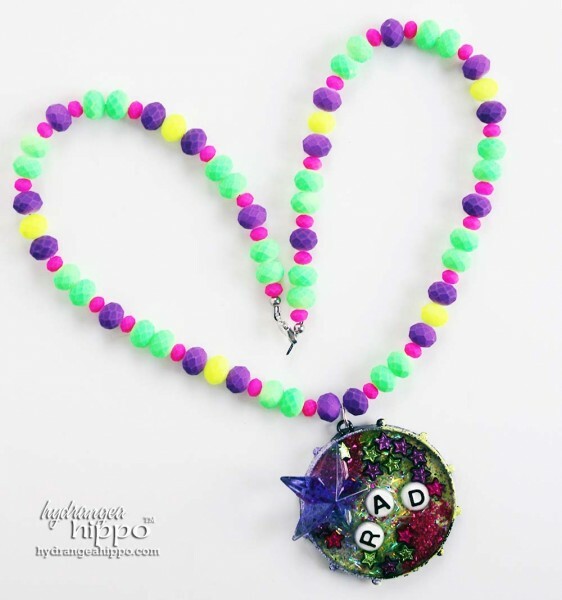 Even the craft stores have jumped on the bandwagon, with neon beads and more. I knew finding a plus size 80's prom dress was gonna be a ridiculous challenge. The way I was going to get into this party was through accessories, like neon jewelry! Enter ICE Resin® and ICED Enamels™. Disclosure: This post contains affiliate links. I make a small commission if you buy from the links. 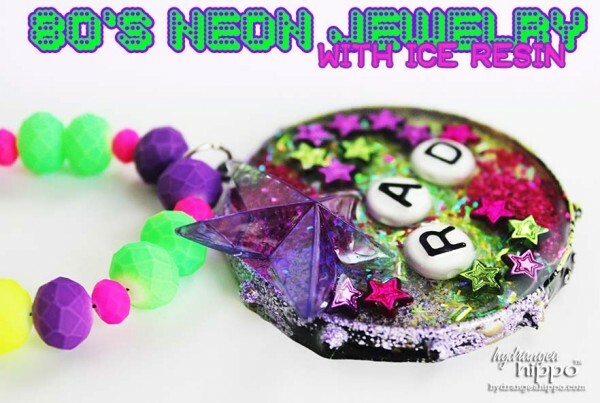 I remember ICE Resin Vice President Jen Cushman telling the story about everyone's reaction to her neon-esque color choices for Iced Enamels. They are pretty shocking colors! But they have lots of possiblity, being that intense. Mix that shocking pink Raspberry Iced Enamels with the Ivory Iced Enamels, and you'll get a pretty, vintagey pale pink. Or to deepen the color, mix with pewter for a darker mauve color. These colors are like raw pigments or even Pan Pastels – you can bring the tone up or down with the addition of black or white. For my 80's project, the bright colors were perfection. 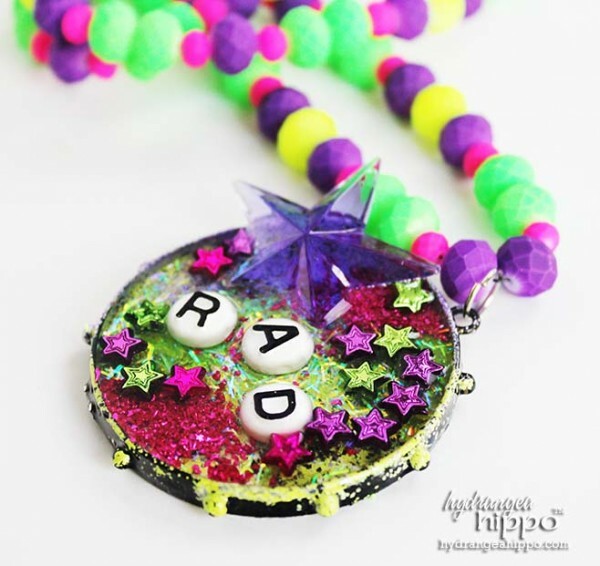 I gathered all of the neonish things in my studio – gummy plastic covered porcelain beads, shimmer star shaped beads, the letters “R”, “A”, and “D”, ICE Resin's Art Mechanique glass glitter, and Sparkle Fibers. (A note about Sparkle Fibers – they were discontinued by Clearsnap but you can still find them in some places online – see the supply list at the end of this post). All of these items would be the stars of a giant bezel that I'd fill with ICE Resin to keep everything in place. ICE Resin's bezels are amazing for jewelry projects but their color was just too subdued and dark for my project. I remember Susan Lenart Kazmer talking about painting things with nail polish…so I painted the bezel black with some of Katie's nail polish! Then I painted Iced Enamels Medium in several places where I wanted to highlight the hobnail details and edges of the bezels. I sprinkled on Chartreuese Iced Enamels in some places and Amethyst Iced Enamels on other sections to add color to the stark black bezel. And then I decorated the inside! I wore this to SNAP and now Katie wants to keep it. What?! Would you wear something like this?